People who know me know that I have really sweet tooth. However, too much of sweet could cause overweight and even diabetic! Glad that with the advance technology nowadays, we have the sugar replacement that is stevia sweetener. As a healthy alternative sweetener, stevia sweetener is 30 times sweeter than sugar and with no effect on blood sugar and little aftertaste, so wonderful. 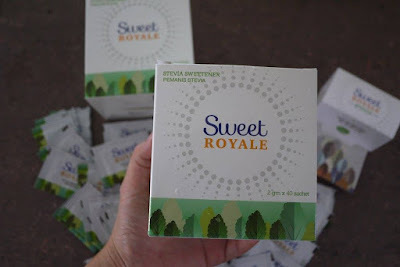 There are quite a lot of Stevia Sweetener brands available in the market, I have recently tried the SweetRoyale Stevia Sweetener by Pharmaniaga. Why this and not others? One of the important reason is that Pharmaniaga is one of the biggest GLC pharmaceutical company in Malaysia, so I believe in it. 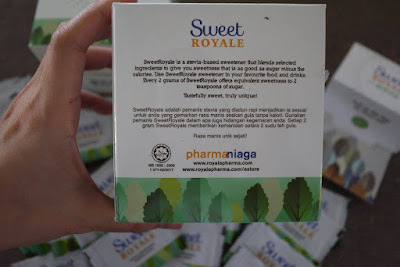 According to Pharmaniaga, SweetRoyale is a stevia-based sweetener that blends selected ingredients to give us sweetness that is as good as sugar minus the calories. It is in powder type which is easy to add into our drink or food, it blends well and quick too. Erythritol, Xylitol, Stevia, Anti-caking Agent as Permitted Food Conditioner and Oligo fructose. Recommended usage: Use one sachet of SweetRoyale for the sweetness of two teaspoons of sugar. We can add SweetRoyale sweetener in our favourite food and drinks. 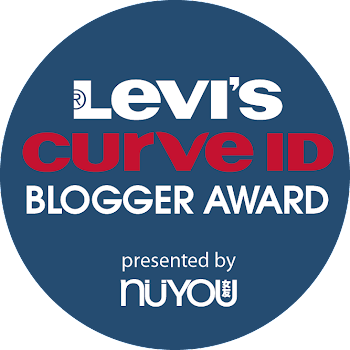 I use it on both hot and cold drinks, from coffee to juices. It taste naturally sweet and smooth. Every 2 grams of SweetRoyale offers equivalent sweetness to 2 teaspoons of sugar. A box of SweetRoyale sweetener contains 40 sachets of 2g each. 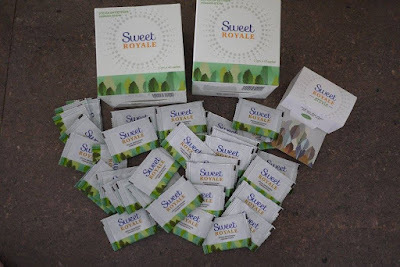 SweetRoyale Stevia Sweetener is suitable even for diabetic patients. It is HALAL certified by JAKIN with HALAL number MS1500:2009, 1071-02/2017. For postage, it is RM 15.9 + postage fees and for COD is RM 17 per box. You can also get it from all RoyalePharma pharmacies in Malaysia. 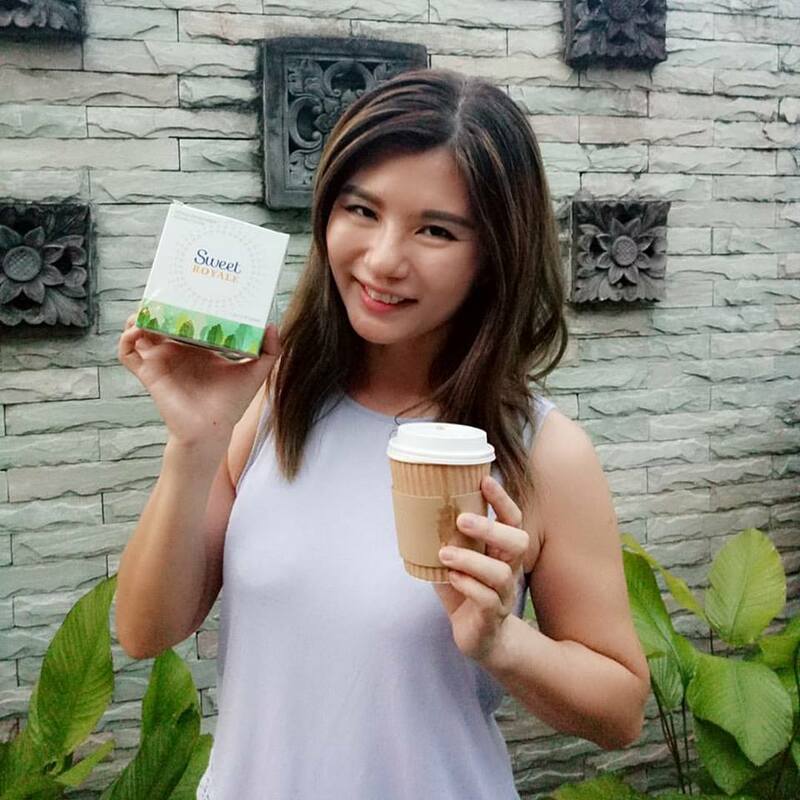 It is also available at Online Website Royale Pharma and shopping Website like Lazada, 11Street & Shopee. Try it out yourselves now. 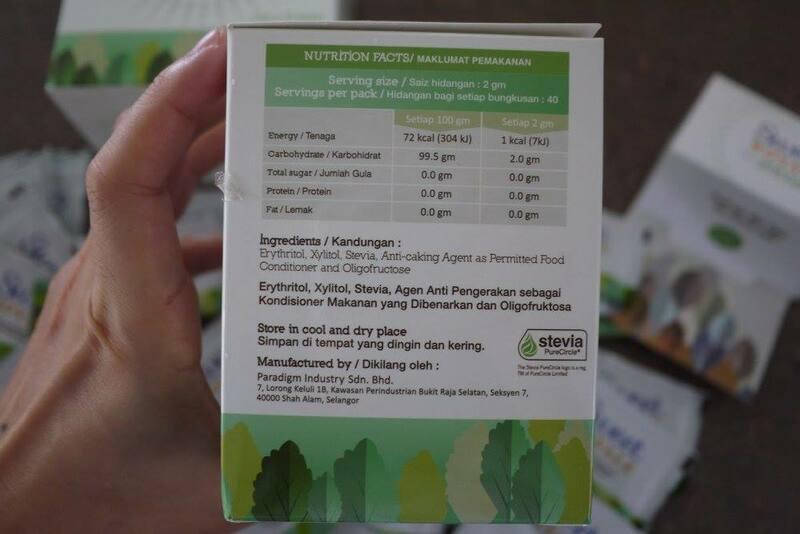 prnah air minuman yang rakan bancuh guna stevia yang kering. Boleh tahan rasanya. Stevia is good for health especially for those who have diabetic and diet control..
Stevia memang bagus untuk mereka yang ingin kawal gula dalam darah. Contohnya pesakit kencing manis atau diabetes. 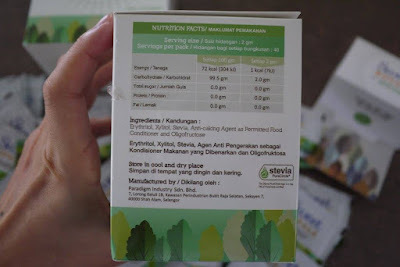 Ruby pun amalkan stevia or tiada gula langsung dalam minuman atau makanan. Slowly cuba. Sebab gula ni macam dadah, kita ketagih. Tapi ia tidak melanggar undang-undang. Tapi membahayakan kesihatan. Stevia is really good.